Christmas is coming, but you’ve still got plenty of time to whip up a few handmade gifts on your sewing machine. 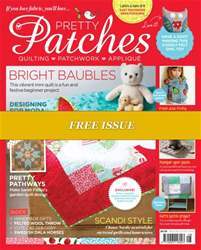 In this issue, quick makes that would be ideal for giving include a cute tea cosy, a stylish hot-water bottle cover, a quilted dog bed, or a very huggable felt owl toy. 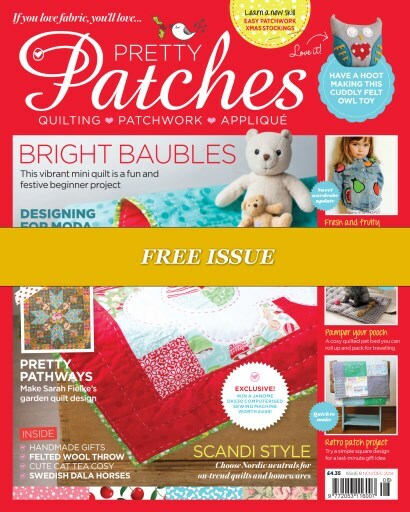 Patchwork pincushions are great for a last-minute stocking filler, but for a special gift that’s still easy to make, try our simple patch throw in fun retro fabrics or celebrate baby’s first Christmas with our cover project, a dinky bauble quilt. Embrace the Scandinavian trend with projects in elegant neutrals, such as our heirloom Whisper quilt or cosy felted wool throw, but don’t forget a splash of vibrant red for your festive decorations – this year, we’ll be decking our halls with Tilda patchwork stockings and traditional Dala horses.